You submitted your questions about Britney's Piece Of Me shows on Twitter, and we got the answers straight from Show Producer Baz Halpin himself! Read below to find out what Baz's favorite performances are, the major challenges of putting on a pop show, and just how tall the Toxic tree is! 1. @AnafanBritney - What's your favorite performance of Piece of Me show? It's hard to pick a favorite but I love Toxic because the world is so vivid and really brings the entire room into the scene. I also love the UV world for Scream and Shout / Boys. Perfume and Lucky are beautiful quiet moments when we get to focus on just Britney. So its kind of hard to pick just one moment. I love them all!! 2. 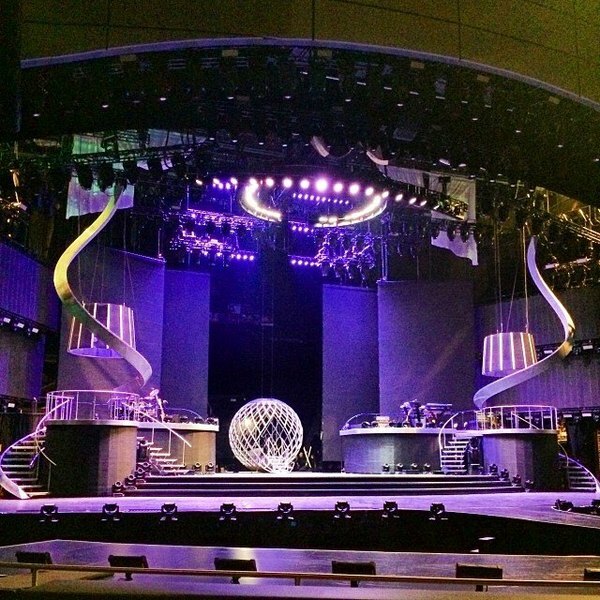 @brettschorr - How many lights are used for the show? We have around 625 lights in total. To put that in perspective, that is about twice what you would see when you go to a big arena concert. 3. @Robin_H00d - Mr. Baz was it overwhelming knowing you were in charge of creating a retrospective show 4 one of Pop's biggest icons? We were trying to pull off the biggest pop show Las Vegas has ever seen in a very short amount of time. The pressure was enormous but we had a great team around us and Britney was fantastic. She was always calm and in control which helped everyone else to feel at ease. 4. @RealBRITannica - Exactly how tall is the tree Britney jumps off of during Toxic? The tree is about the size of a 3 and a half story building. When Britney jumps off it she is about half way up. It weighs about the same as two mid size cars but can be pushed and turned by just three people. 5. @BlackoutPriest - How will you describe the overall experience of #PieceOfMe shows so far? It was a huge amount of work to put together such a big show in a short amount of time. There were times when we were exhausted working long days and through the night but in the end the show is a success and I think we all feel proud. 6. @BritWorkBitch - How does it feel to work with Britney on this Vegas Residency? It's an honor to work with such an iconic figure. She is very passionate and kind person. It's wonderful to get an opportunity to work with someone so collaborative who is willing to put in the long hours or hard rehearsal to deliver the best show possible. 7. @Silasng8 - What was the most challenging aspect of planning the show? We were restricted by the size of the backstage area so planning to get all of the massive props on and off the stage was a real challenge. A lot of what we needed to figure out and technically rehearse couldn't be done until we got to the theatre in Las Vegas. So even though we had months of rehearsals in LA, we still needed more time in Las Vegas. So trying to figure out all of the technical requirements while rehearsing the show and having only 12 days to do it was quite a feat. 8. @gedsou - What's the biggest challenge for a show staying in one place for years? We want to keep the show fresh so we planned for this. Over the course of the show songs will get added and changed as Britney creates new music and perhaps wants to incorporate some other songs from pervious albums. The show is structured so that changes can be made. 9. @BritBritFan4Eva - How would you describe britney in one word? Just one word?? Thats tough. Can I use lots of "one words"? Fun, Talented, Caring, Loving, Sincere, Joyful, Kind, Considerate, Shy, Outgoing, Brave, Energetic. That's too hard a question. 10. What other artists have you produced for? How did you want to make this production different from the rest? I've worked with lots of artists, from Pink, Taylor Swift, Katy Perry, Cher, Tina Turner and many more. The key to keeping each show different is to collaborate with the artist to make sure that it remains their show. I spend most of my time getting to know what the artist likes and dislikes. Passions, hobbies, interests, influences etc. This way each show is an extension of the artist. 11. What was your inspiration for the production, visuals, and lighting? We created a large set that was essentially a black canvas. Because the worlds in the show were so different from Circus, to Jungle, to Neon, to Japanese Garden. The set had the ability to become any of those things and then we used props and lighting to complete the look. 12. How long do you normally spend in planning a production of this magnitude and how long did the Piece of Me production take? You could spend years putting a show together if you had the time but I think all in all we spent about 6 months putting this show together before the first night. Sometimes we have put shows together in less than a month but that is not ideal. 6 months is a good amount of time. 13. What was Britney's vision for the show? Britney wanted to create a show that was fun for the audience and fun for her to perform each night. We wanted to create a club-like atmosphere where people could get up and dance, and most of all, have a great time. The show is a retrospective of all of her hits over the course of her career. We wanted to make sure that we re-imagined them in a new and fresh way that gave a new lease on life and something you could only experience right there in the Axis Theatre in Las Vegas.